Supplier & Distributor of Vibrating Screen. Our product range also comprises of Coal Handling Plant, Food handling Conveyors and Roller Conveyor. 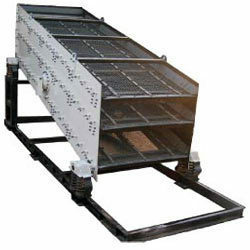 This Vibrating Screen is used to transport different materials from one place to another. These vibrating screens are fabricated from high grade quality materials and provide excellent result. We manufacture and supply vibrating screen to our customers at vast range. These screens are light in weight and very easy to handle. These screens are known for their features like resistance to corrosion, durable and long lasting service. Looking for Vibrating Screen ?